2101 Constitution Ave, N.W., Washington, D.C. The Great Hall of the National Academy of Sciences was designed by architect Bertram Grosvenor Goodhue, working closely with sculptor Lee Lawrie, and artists Hildreth Meiere and Albert Herter. 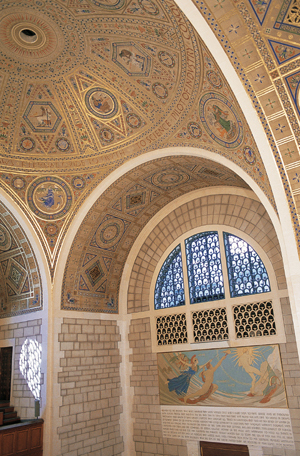 As throughout the National Academy of Sciences building, decoration celebrates the history and significance of science. Prior to visiting the NAS Building, download the free NAS Great Hall iPad App from iTunes. Don't have an iPad? You can check one out during your visit from the NAS Building security desk. You will need to leave a government issued photo ID with security.